Band shoots video outside of L.A. The new Metallica album, Death Magnetic, will be released on Friday Sept. 12 via Warner Bros. This is not the first time the band has broken from the traditional Monday/Tuesday release pattern - their last album, St. Anger, was also issued on a Friday. No reason was given for the decision. In 2003, the group's label claimed a Friday release would prevent pirated copies of St. Anger from entering the marketplace. 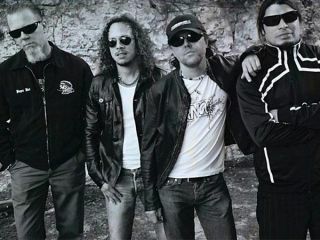 Over the weekend, Metallica shot a video for the first single, The Day That Never Comes. Describing the experience on their website, the band says, "Today we shot a video...nah, more like a short film really...for the first featured track from Death Magnetic. Directed by fellow Dane/filmmaker Thomas Vinterberg, we spent the better part of the afternoon playing The Day That Never Comes to a sold out crowd of dust and smoke just outside of Los Angeles, CA...Should be ready to share with all of you at the end of the month, give or take..."
Metallica will be performing this Saturday (Aug. 9) at Ozzfest in Dallas. At that show, guitarist Kirk Hammett will join Slayer's Kerry King, Alice In Chains' Jerry Cantrell and Anthrax's Scott Ian in a tribute to late Pantera guitarist Dimebag Darrell Abbott, who was murdered on stage in Columbus, Ohio, in 2004.